The CTA predicts that rail ridership will continue rising and bus ridership will continue to drop. Despite the same number of bus service hours, service is owow and gas is cheap. Chart data from CTA budget. Compiled by Yonah Freemark and Steven Vance. Earlier this week the Chicago Transit Authority announced its proposed budget for 2017. Mayor Rahm Emanuel touted the fact that the budget “freezes” the $2.00 and $2.25 cash fare on buses and trains, respectively. However, it would be wiser for the CTA to raise fares incrementally each year to accommodate perennially rising costs, and give itself more breathing room to add or expand bus route changes without having to find an equivalent cost to cut elsewhere in the budget. The agency’s repeated decisions not to change the “base” fare could lead to a future doomsday scenario. Chicago is currently experiencing a building boom, but if development slows the CTA will have less funding from its share of local sales taxes, and from the real estate transfer tax (a tax on property sold). At that point it will need to cut staff and service, or raise fares steeply, to a price that would likely be higher than if the fares were raised periodically. Although the total number of rail and bus rides in 2015 was 516 million, up 1.6 percent from 514.5 million in 2014, the current budget projects that total annual ridership will have dropped by nearly 17 million rides from 2015 to 2016. A majority of this drop will be seen on bus routes. The CTA also predicts a total drop of 3.4 million rides, all of them on bus routes, between 2016 and 2017. The agency is projecting an increase in rail ridership. Tolman said the drop in bus ridership is caused by “low gas prices, traffic congestion, [and] shifting population trends.” He added, “CTA ridership, especially bus, has been heavily influenced by gas prices over the last 20 years. Inflation adjusted gas prices are near 100-year lows and are forecasted to remain low in 2017.” Figures from the Federal Highway Administration show that people drove more last year than the previous peak in 2014, which followed a decline during the recession. The large majority of the CTA’s recent infrastructure investments have involved upgrading or replacing rail stations. Some studies suggest that people find service frequency and travel time to be the most important determinants of rider satisfaction. Fare prices were found to be a moderately important factor, and Wi-Fi was found to be relatively unimportant. The federal government provides the bulk of CTA’s capital funding, but most of that money has been used to build and replace stations and rail routes, as well as to create the Loop Link express bus corridor. Sometimes money is available for overhauling vehicles, but nothing is available for maintaining stations. The CTA is doing what it can to stop the ridership losses by increasing service in some areas, but current plans don’t call for new bus rapid transit service. The proposed Ashland BRT plan was backburnered after fierce opposition from some residents and business owners to plans to convert travel lanes to bus-only lanes and prohibit most left turns from Ashland. Tolman hinted the CTA may implement the Ashland plan in the future. “We are considering options and potential modifications, including the inclusion of additional left turns, based on that public feedback,” he explained. “We also are continuing the process of securing funding to continue project design. Currently, there is no specific timetable or sources set for the design funding so it does not make sense to include it in the 2017 capital plan.” The Ashland BRT project isn’t in the CTA’s 2017-2021 Capital Improvement Plan either. The CTA recently extended bus routes and added service in the Far South Side and Southeast Side, and is testing off-board bus fare collection on the Dearborn/Madison Loop Link platform and the Belmont Blue Line station to speed up boarding. The practice should be expanded to all Loop Link stations, but there isn’t yet a plan to do so. Tolman said the results from there, and the Belmont stop, where prepaid boarding will be made permanent as part of an upcoming station rehab will inform decisions about where else in the city they should implement it. In partnership with the Chicago Department of Transportation, CTA has added Transit Signal Priority on Ashland Ave. between 95th St. and Cermak Rd., and will expand this all the Irving Park Road next year. The TSP computer will notice when buses are approaching intersections and can decide to hold a green light on Ashland longer, or change to green sooner. Not only are low gas prices causing people to drive more, total gas sales have an effect on CTA’s finances. Illinois gas tax has been stuck at 19 cents a gallon since 1991. Due to inflation, that money – divvied amongst many transportation agencies in the state – has less and less buying power each year. So even as more people are driving more than ever, the CTA receives less revenue each year, in terms of what that money will buy. Riders abandon buses when they are too slow, don’t run reliably enough and generally fail at transit’sbasicr goal–getting you where you need to be in a reasonable time. Axing express service as CTA did several years ago on Western and Ashland was like giving riders the middle finger. Meanwhile, Rahm proceeds on the patronage rich, huge waste, Red Extension. IF he were serious about better transit on the South Side he would work to implement the http://www.grayline.20m.com/ including service from Kensington to Hegewisch on the South Shore which used to have stations along that route duplicating planned Red Line stops. At minimal costs of a few platforms w/ventra TVMs and the labor cost of running MED cars all day which now just sit unused near 18th st midday, this could be up and running before his next election run. Giving CTA crosstown bus riders a second and faster option to the Loop should see more riders. On a more general level, CTA needs to improve bus reliability and speeds–step one transit signal priority, step two POP all door boarding system wide, step three, queue jumps at stoplights to give buses a headstart, step four more of the “Red Carpet” lane exclusivity as currently done on Jeffery Blvd. The timidity shown in failing to properly implement the Loop Link service must be reversed. The patronage rich grand plan BRT projects entail huge costs of mendacious community mtgs., EIS/EIRs, over priced special buses, and years to see results; easing in the above listed features is much simpler and improved transit can be achieved more rapidly. There is no financial connection between the Red line improvements and Xpress service on Western; the costs for the Red line upgrade – as was stated in the article – come mostly from the Feds whereas the Western Xpress comes out of the CTA’s operations budget which comes from fares. Also, you can’t improve bus speed because buses are stuck in traffic like everyone else. You may be able to nibble around the edges by closing down some stops but it wouldn’t make all that much of a difference on most lines. Signal priorities would mean at the least replacing every traffic signal and at worst digging up intersections. Talk about patronage rich! Capacity is being reached on the Red line (and soon the Blue line) not along the city’s south shore. Gray is not the new black. Why are you calling these plans “patronage rich”? Sure the Gray only makes sense right now if the funds can be moved from the Red to Gray. But all David’s other incremental ideas can be done, yes incrementally. Priority lights at critical bottle necks as well as red lanes at critical bottle necks have a good chance at significant results. Yes the ultimate solution is actual BRT. But incremental like the recent return of the X49 Western express do produce results. It’d be interesting to do a deep dive into how construction has affected bus ridership on Ashland, Western, Damen and Fullerton buses and to see if those numbers have decreased if they rebound after next year once the Damen/Elston/Fullerton mess and Western reconstruction are done. Many cities around the world have adopted “bus/taxi only” lanes, which often require taking travel lanes away and banning on-street parking. Chicago doesn’t seem ready to embrace this on a scale that is needed to improve mobility–the traffic mess likely needs to become even worse. Thus taking a bus during rush hour on streets like Irving Park or Michigan Ave. remains an exercise in tedium. My best guess for this is that many formally black and immigrant neighborhoods around the city which are now trendy are losing density due to a lot of rehabs and conversion of 3 flats into SFH Mcmansions. This causes a loss of bus ridership which has always historically been used by immigrants and blacks and now these neighborhoods are seeing demographic shifts towards whites who prefer rail. Also I imagine the new TOD that is happening also has to do with growth skewed towards rail. Because I believe the construction contracts will go to “connected” entities. FWIW US infrastructure projects are vastly more expensive than in any other “first world” country. I have a hardtime envisioning$2.3b for the project and we know from experience that there will be major cost overruns and delays. Was the Red Line rehab a) done by “connected” entities b) delayed or over budget? I took a look at the annualized ridership to have a bit more insight into what it driving the declines. I don’t know too much about changes in service frequencies on specific lines, but the likely trend (without knowing the answer) is that ridership declined a lot where there is decent competing rail service. Here’s where I got the data: http://www.rtams.org/rtams/ridershipDetail.jsp?dataset=ctaBus. I’m happy to share the spreadsheet with anyone who is interested. I used July data (it was the default) and selected weekdays. I used 2009 – 2015. The Western Express had 15k riders in 2009, in 2015 it has 5k which is a huge loss. Sheridan, Clark, Broadway, Milwaukee, and Outer Drive Express, King Drive could be riders who switched to rail because with more frequent service it was more attractive. As for some of the south side buses, maybe the Jeffrey Jump stole riders from feeding into the el? Just a guess. Almost every line saw declines. There only lines with significant ridership additions were the Jeffrey Jump. 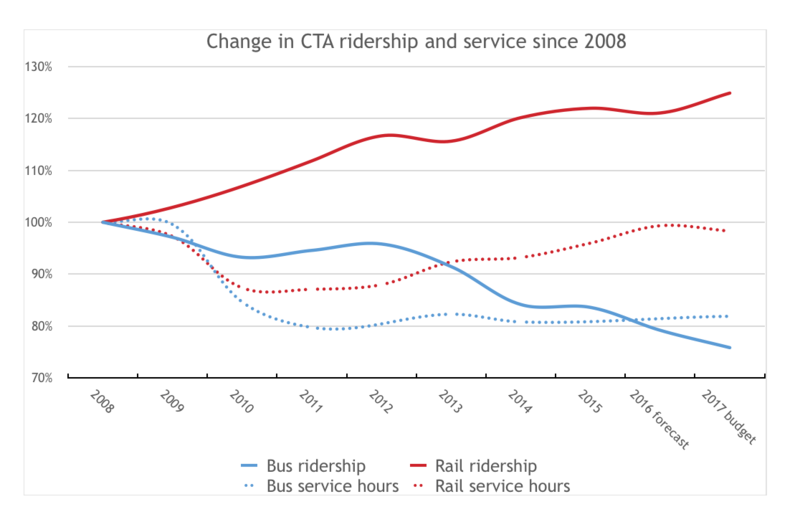 The decline in CTA bus ridership looks to me to be a consequence of funneling money into the rail service. Where riders could, they (apparently) switched to the train. But overall ridership is down around the country, it’s not a problem unique to Chicago. So maybe Divvy, Uber, and longer headways have eaten at the numbers. But I think the data says that some experimentation is needed to get people back on the bus. Looking at data for July, not much. Sorry for the stinky cut/paste. The decline mostly came from things closer to the lakefront. The millions of rides lost (that SV quoted) can’t all be TOD and home conversions. Something else is driving this. okay, so FA Paschen has been the CTA’s primary station contractor for the past couple of years. How are they connected? We’ve seen maybe 2000-3000 new TOD units developed or proposed since the ordinance. Even if every single one of those units generated two transit trips, seven days a week, that’s still only 1.8 million rides per year. That seems like a lot, but it’s only 1/3 of one percent of CTA’s annual ridership. CTA conducts competitive bidding for all station projects. FH Paschen does seem to get a lot of them; I assume it’s because they are familiar with CTA work and they can spot savings that other contractors don’t. Inflated costs are a a consequence of excessive engineering standards, costly “signature” design elements, and Davis-Bacon rules IMO. It’s not the kind of blatant graft you’re imagining. Agreed on most fronts. Grayline must continue to go to Blue Island. Streetcars would be a more attractive option on Ashland. I sense that In an Obama>Clinton administration there may be more Fed$$ for streetcars vs BRT.